What are the benefits of buying a home with a fenced-in yard? This is 1 of many questions new home buyers have. The main answer? Homes with fenced-in backyards always fetch a higher price than homes without because over half of all prospective buyers have families with children, pets or both. If you happen to find a home with a fenced-in backyard by Fence FAST, you should count it as a blessing. All of our fence installers do top-notch work. It’s always better that someone else has installed the fence so you can immediately take advantage of it. If you live in town or in some Housing Developments, you need to install your fence quickly. 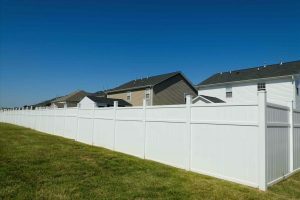 If not, your neighbors may start boxing-in your property with many styles and types of fencing in all sorts of colors. Construction costs can rise when the fence contractor can no longer access your property easily due to your neighbor’s fences. 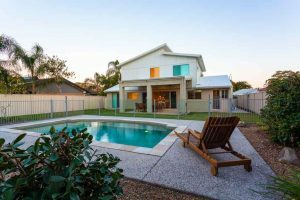 In town where most homes come with postage stamp-sized yards, it becomes clear quickly that a fence is needed due to the privacy and proximity of your neighbors homes. It can be uncomfortable having your neighbors watching, listening, and sharing private telephone conversations, family moments, special events, or parties etc. The physical boundary that a privacy fence provides cannot be taken lightly in a society where privacy comes at a premium today. But the privacy and intimacy you have with your family is a luxury that should be preserved and protected when in your own backyard. My favorite feature of a fenced yard is the limited accessibility it provides to a property. This is most important if you have a swimming pool or hot tub in your backyard entertainment area. Adding a fence with a locking gate allows you to properly control the people who have access to this potentially dangerous area of your yard. Pool safety is incredibly important. The last thing we need is to have a child from the neighborhood drowned in a backyard pool unsupervised. Installing an extra tall pool fence with locking gate will give you the ultimate in control and access to your pool that provides the peace of mind that the children who live near you are safe. 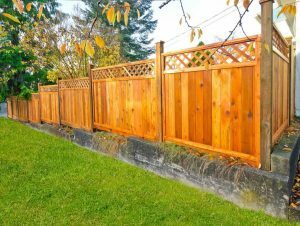 Besides keeping people out of your yard, another great feature of a backyard fence is the deterring of unwanted pests into your yard. This is especially nice if you’ve had problems with your neighbor’s pets coming into your yard and using it as their bathroom or tearing up garbage and things like that. Not only will offense keep your neighbor’s pets out but it’ll keep your pets in while giving your children a safe place to play. It can be very comforting to know that they can’t get out of your fenced-in backyard making the busy road out front much less of a danger. As if all the safety and privacy features of your backyard fencing Aren’t Enough, there’s the aesthetic considerations as well. A nice vinyl fence that matches the color of your home makes your curb appeal take a dramatic rise. 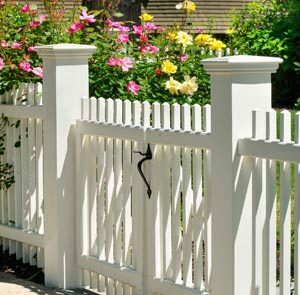 Homeowners who add a fence to their home or upgrade an existing fence get more value than what is visually obvious. Your needs will determine exactly what type and style of fence you need but a good fence often times provides unexpected security for the homeowner who installed it. Whether you need to secure your pool area, keep your pets inside your yard, or keep small children out of Harm’s Way the best option available is a fence by Fence FAST.